New Embed ChipBot, API docs, and API enhancements. About every 30 days, we’ll post new features, important bug fixes, roadmap changes, or modifications users have requested. These posts help us communicate what’s in our work pipeline while opening a formal channel for you to respond back to us. If you’re a user of ChipBot, please reach out to us at support@getchipbot.com for any features you want. If you thought you missed March’s update… you did! It’s because we changed our format to be posting at the beginning of the month instead of the end. Our last update was February 28th, so modified the days a bit. The minor change will be consistent with industry standards and you’ll see our updates alongside the products you use. 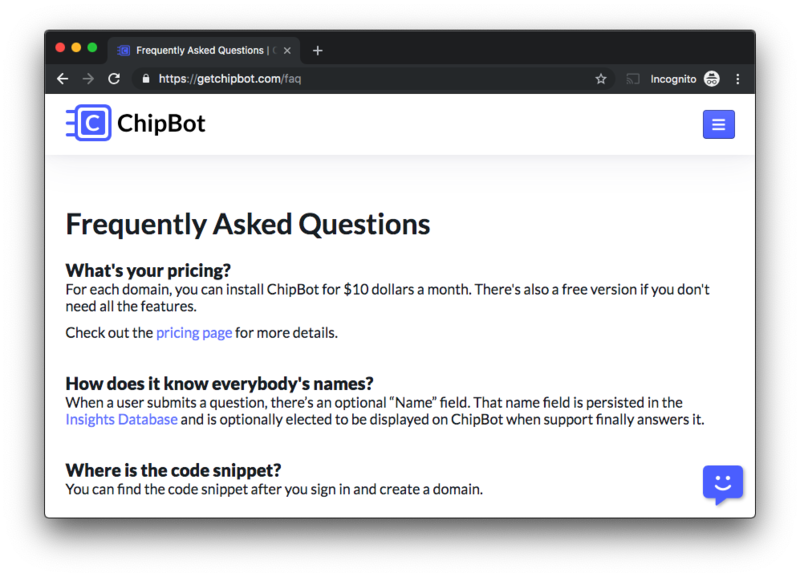 With the new Embed ChipBot script, you can now create FAQ pages based off of ChipBot’s Insight list. This allows you to have a living FAQ page while leveraging ChipBot on every other page of your website. A sample of our FAQ page. All generated by ChipBot. One of the key objectives with ChipBot Embed is to make it as seamless as possible to integrate the data into your existing website. We went with the approach of delivering a white-labeled solution so the content matches your website styling without further customization. This leads to a seamless experience for your users and opens the possibility for CSS modification through your theme’s stylesheet. For those interested in how it works under the hood. Here’s a screenshot of what it looks like within a website and within a plain HTML file. You can access the ChipBot Embed code within your Domain Dashboard. If you have any trouble, please reach out at support@getchipbot.com. To our surprise, we have a solid base of users who come from a technological background. In response to this, we’ve released our first draft of the ChipBot API docs. It’s a great starting point if you’re trying to figure out if you want to integrate ChipBot with your other services or with your own product. 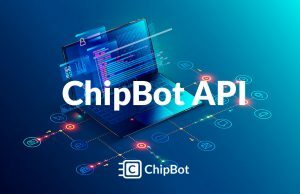 Now with direct API REST endpoints and a Zapier integration, ChipBot can automatically contribute unique insights to your data intelligence. Click here to the API documentation. If you’re interested in our Zapier integration, please email support@getchipbot.com for an invite code. 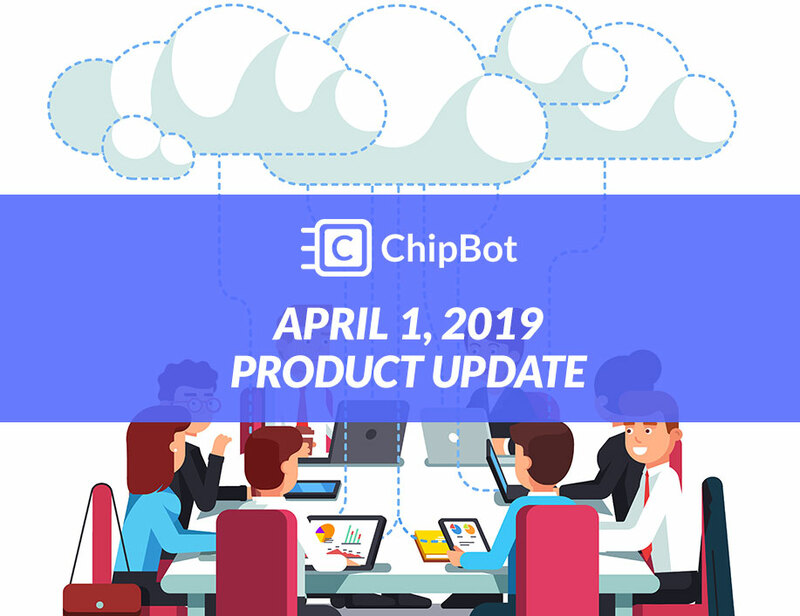 With the help of a couple of our technical customers, we’ve released a couple of new endpoints to make it easier to integrate ChipBot on your page. First, we’ve added a new onReady function to help determine when ChipBot APIs can be called. Second, there’s a new asyncChipBotApi object that mimics one to one with chipBotApi. The async version allows you to invoke API commands without caring whether ChipBot is ready or not. We’re still working on the new reporting dashboard. We wanted to prioritize some of the features noted above and bug fixes that we found in some edge cases. Check out our March update to see our plans around reporting, we’ll be releasing this near the end of the month. This will be consuming most of our time in April. Improvements around dashboard UX and onboarding. We know the triggers UX is a bit confusing when saving new data, this will all be updated by next week. Matt is a Chicago-based entrepreneur and hard-working founder of his startup ChipBot. Knowledgable in 12 different programming languages and experienced startup veteran; having worked on 6 others. He focuses on solving hard problems using clever engineering and wit. You can reach Matt on Twitter, LinkedIn, or StackOverflow. 2019 ChipBot, Inc. All Rights Reserved.